It’s no Get Out, but that might not be a bad thing. Who do you trust? 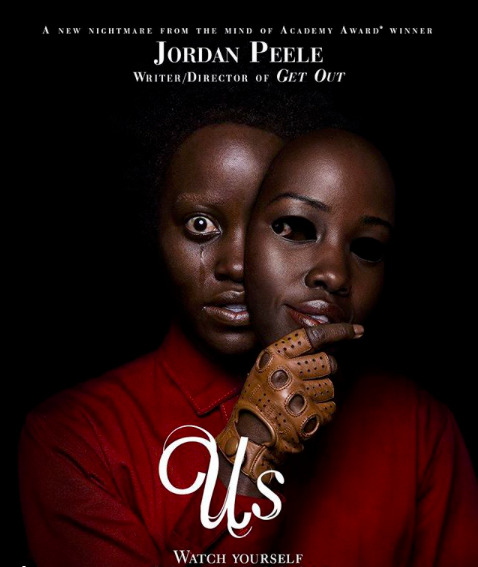 That’s the question Jordan Peele has everyone asking with the long-awaited release of Us, Peele’s second directorial debut and the newest (and hottest) horror movie out right now. While it lacks the comedic element that made Get Out so refreshing, the movie certainly makes up for it in how deep the plot gets. This is that movie that will leave you unsettled and uncomfortable. There’s a reason why Us is a horror movie. Starring Black Panther costars Lupita Nyong’o and Winston Duke, Us starts off with the simple family-on-vacation trope. What awaits them is a horror unlike any other: evil doppelgängers. Yes, that’s right, the villain this time is ourselves. But it only gets deeper and more complicated from there. Adelaide Wilson, played by Nyong’o, is the quiet, shy mother married to well-meaning but slightly clueless Gabe. Daughter Zora is stuck in her snobby, young teenager phase and Jason, the younger son is obsessed with magic tricks. Other than Adelaide not having enough rhythm to properly snap to I Got Five On It, it seems like a normal family out on vacation. What her family doesn’t know is that Adelaide suffers from Post-Traumatic Stress Disorder brought on by a terrifying but mysterious incident in a funhouse full of mirrors. We’re given a dark, eerie look into young Adelaide walking unaccompanied into the mirror house, but left in the dark as to what- or who, Adelaide saw. While she only goes missing for about 15 minutes, her parents reveal to a therapist how severely traumatized Adelaide is: she refuses to speak, and her own mother barely recognizes her anymore. Back to present day, we start seeing the unraveling of Adelaide’s sanity, clearly uncomfortable at the very beach where she had encountered whatever it was that she saw nearly 30 years ago. When her son goes missing, she rightfully panics, claiming that him running off is something they cannot allow. Her son fails to mention that he had seen a creepy figure dripped in blood just standing like a scarecrow in the middle of the beach. Casual. Things pick up once the family books it back home. Lights go off, Adelaide is terrified and boom- “I think there’s people outside.” Much to Wilson’s horror, the strangers outside look exactly like them, covered in red jumpsuits holding golden scissors. Except, the family is off. It’s just not quite them either. Fans of the trailer will recall Gabe telling the doppelgänger family that he’s ready to go crazy, and do they bring crazy. The movie takes a Funny Games meets The Strangers turn, with the twin family holding the ‘real’ family hostage. Adelaide’s look-alike lays it out for the family: they are their shadows, having lived miserable versions of their ‘real’ lives. In fact, Red, Adelaide’s clone, admits to having waited years for her revenge. And so begins the family’s epic fight to get away from the doppelgängers. But it’s not just the physical situation that is terrifying. It’s more of not knowing who they are, and why they are there that’s unsettling. When Adelaide asks Red who they are, Red looks at her with hollow eyes, saying perhaps the scariest thing she says in the whole movie: they are Americans. What could be the reason behind this? Major spoiler alerts at this point. Peele approaches this movie as social commentary on the American identity as a whole. In their final showdown, Red reveals to Adelaide that they were tethers, an abandoned science experiment created by the U.S. government to attempt cloning people. The experiment, however, was a failure because the clones did not have the same souls as their actual counterparts. So, the tethers were left to wander the millions of tunnels found abandoned underneath the subways of the United States- a little tidbit mentioned in the beginning of the movie. So, these clones are back not because it is the end of times, which is what Bible passage Jeremiah 11:11 hints at (also sprinkled throughout the film), but rather because Red, the only tether able to communicate and think properly, is their leader. How did this happen? Well, it turns out that the thing that had traumatized little Adelaide was seeing Red in the mirror- except it wasn’t really a mirror. And also, they pulled a whole Parent’s Trap. That means the Adelaide we know is actually not Adelaide- it’s Red! In the time between Red being raised as a child with suspect PTSD and finally reuniting with her clone, the ‘real’ Adelaide is forced to take her place in the strange and dark underworld of the tethers. This makes Adelaide angry enough to start planning her revenge, an effort 30 years in the making. As to the other clones that make up the really creepy Hands Across America, it’s simply another hint at the bigger theme of the betrayal of the American government, and the American identity itself. Hands Across America was a real charity event dedicated to raising awareness about worldwide hunger and famine. On May 25th, 1986, 6.5 million people tried to hold hands across the country to raise money. Out of their goal of $50 million, they only raised about $34 million- and only half of that was actually used for donations. The failed charitable act is a reminder of the failed promises our government has made to the populations that most desperately need help and resources. It’s also the last human thing Adelaide remembers after being thrown into the Tether world, as we see her handcuffed to a bed in a Hands Across America t-shirt. So, what could be the real message behind Us? Perhaps it is as simple as that the government has played the role of God for too long, and that they have failed those that need them the most. Or maybe it is that deep down, we are all hiding behind ideas, beliefs and movements that fail to do anything to really help others. In fact, they end up hurting us. Perhaps the biggest lesson from this movie, though, is that at the end of the day, sometimes we can’t trust even ourselves- especially if we hide behind masks. It’s a lesson all too real for our own modern day horrors .